AU’s graduate business programs feature flexible scheduling options which enable students to learn at nights, online and on some weekends. Perfect for the working professional. The free event will feature a faculty-led panel of current undergraduate degree-completion business students and MBA or Master of Science in Accountancy (MSA) students who will share their experiences in the program. Brian Vander Schee, a marketing professor and director of graduate business programs, will moderate the panel and a Q&A session following. Refreshments will be served. Based on a core of seven required eight-week courses and five additional elective courses, the AU MBA program offers a concentration in leadership as well as the flexibility to custom design programs that focus on a variety of topics, including strategy, human resource management, project management, health care management, data analytics and others. 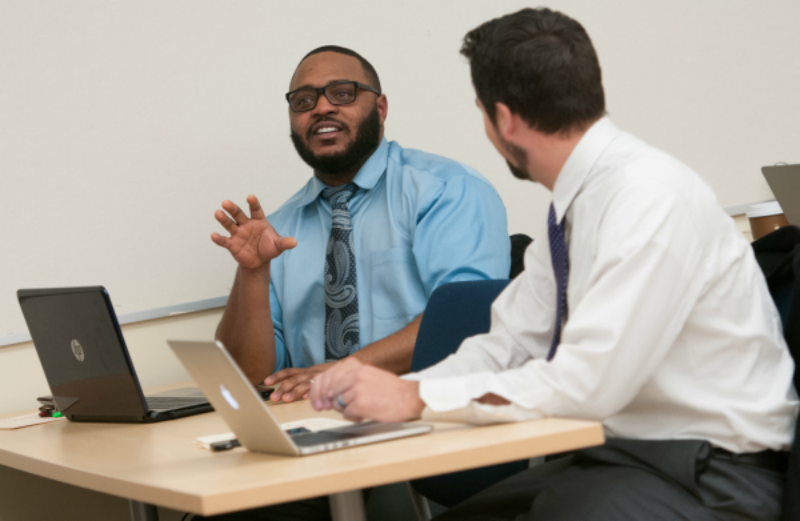 According to Judson Curry, dean of adult and graduate studies, the AU MBA program’s flexibility and convenience has wide appeal among working adults. He adds that the program also provides an excellent foundation on which to build a new career or start a new business. One of the student panelists, Hallie Witmer, who is concentrating in leadership, began her MBA program at AU a year ago. The Naperville native, who now lives in Aurora, graduated in 2013 with a bachelor’s degree in environmental studies and government from Lawrence University in Wisconsin. She currently works at the Peck Farm Park Interpretive Center in Geneva developing nature- and environment-related programming for children — a job she started the same week she started her MBA program. Offering classes at night, online and some weekends — as well as being located just south of I-88 at the AU Orchard Center in Aurora — the AU MBA program has fit easily into Witmer’s busy work schedule. And her studies have already enabled her to apply what she’s learning to her job. Just as important, Witmer noted, her professors and fellow students have helped her gain valuable cross-industry perspectives, contacts and opportunities which will be valuable as she continues to pursue a career in the nonprofit sector. Classes are taught by full-time AU faculty members as well as practicing professionals who are often leaders in their fields. These include Ryan Dowd, executive director of Hesed House in Aurora, the second largest homeless shelter in the state of Illinois. In addition to the shelter, Hesed House manages three housing programs, offers health care and job training programs, and coordinates the activities of some 6,000 volunteers from 70 local churches. Dowd teaches graduate-level classes in nonprofit leadership at AU. Through her connection with Dowd, Witmer was able to gain hands-on experience in fundraising through volunteer work with the Hesed House development department. Witmer expects to graduate from the MBA program in spring 2018. In the meantime, she looks forward to sharing her experiences as an MBA student at the upcoming open house. “If you are interested in expanding yourself, your knowledge and possibly your future, I highly recommend that you come,” she said. Attendees will also learn about AU’s adult bachelor’s degree completion programs in accounting, business administration and leadership studeies as well as the MSA. Representatives from the university’s offices of admission and financial aid will also be on hand to answer questions. To register for the event, please visit aurora.edu/businessopenhouse. For more information, contact the Center for Adult and Graduate Studies at 630-947-8955 or AUadmission@aurora.edu.